Asset Allocation is primarily used with investment and security analysis in Finance and Accountancy fields. It is defined as an investment technique that tries to build a balance between risk and reward system that is designed for getting optimal returns from portfolio investment. In Asset Allocation percentage of each asset of an investment portfolio is adjusted in accordance with investor’s strategy to tolerate with risk, investment time frame and objectives of the investment. There are so many types of assets but Asset Allocation focuses on three classes of assets. These are equities (stocks), fixed-income and cash & cash equivalents. All these have different levels of risk and return with different time horizon to behave. 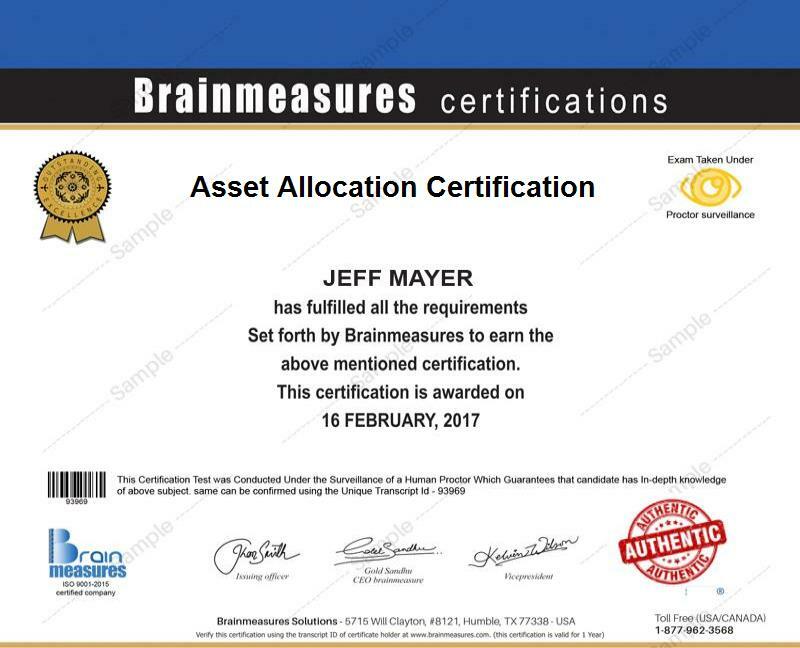 The Asset Allocation program from Brainmeasures is the best certification program regarding understanding of investment techniques, analysis and portfolio investments for optimal return at lower level of risk tolerance. The certificate not just mentors the required knowledge and skills to grasp the techniques of handling assets in investment analysis and portfolio management but also mentor you how to quickly manage your portfolio investment at minimum risk with higher return. How to make accurate decisions for Asset Allocation? This online certification will provide you a competitive edge and competencies in the fields of investment analysis, securities management and optimal capital structure with optimal use of Asset Allocation. Throughout the course, you will learn about different requirements, phases and sub modules of Asset Allocation. Apart from the course road map and required syllabus, an Asset Alliocation exam is also designed to assess your knowledge and skills about Asset Allocation. After a successful completion, you will be awarded with the prestigious Asset Allocation certificate from Brainmeasures. This will definitely be an added skill and experience to improve your Resume and provide the platform to advance in your career path. Getting the entitlement of expert in Asset Allocation and Investment Management after getting certification from Brainmeasures does not only furnish you with the required skills and investment management strategies but also translates it in better earning and salary packages. As per recent trend and demand in this field, average annual salary is expected as $60,000-$85,000 per year and this can further lead to increase by $30,000 or more that totally depends on the type of business and related industry (i.e. manufacturing, servicing or mixed of both etc. ), image of the organization, education, skills and experience of the candidate etc. This course is specifically designed for those who are involved in asset pricing, asset allocation and resource management of the investor as well as business with the help of data and information that is available with brokers, agents and fund managers in the capital and money market. However, it is equally important for students, marketing and business researchers, business teachers, professional ERP trainers, ERP managers, fund managers, mutual fund investment companies, investment brokers and agent as well as financial analysts and experts in the fields of finance, investment management and accountancy.